The present township of Henning (township 133, range 38) began its formal career under the name of East Battle take on July 17, 1878. The first election was held at the house of M. J. Mattson on the fifth day of the following month. 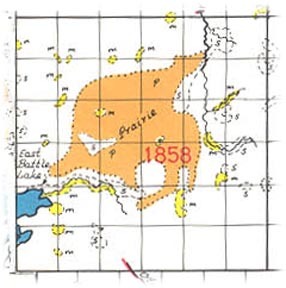 On August 1, 1884, in response to a petition of C. W. Brandberg and others of East Battle Lake township, the commissioners changed the name to that of Henning. On the 28th day of May, 1878, twenty-two of the legal voters of this township presented a petition to the county commissioners asking for the organization of East Battle Lake township. The list is as follows: M. P. Mattson, T. Christensen, Ole Christensen, C. Tyggeson, Peder C. Janson, Samuel Anderson, Barow Swanberg, B. L. Riis, Charles Johnson, Christen Christenson, Julius Paulson, Olaf F. Johnson, Christian Kangballe, Hans Markuson, Olaf P. Penson, Andrew Olson, Halvor M. Sorknes and August Pitters. This was the thirtv-eighth township organized in the county and began its official career on the same day as Bluffton. Henning is bounded on the north by Leaf Lake, on the west by Girard, on the south by Folden, and on the east by Inman. It can truly be said that the township has no lakes entirely within its limits. The southwestern part of the township is drained into East Battle lake. The northern and eastern parts drain into a small tributary of Leaf river which rises in Elmo township, flows through Inman township and enters Henning in the northeast corner of section 24. It then meanders across the northeastern part and leaves the township in the northwestern corner of section 2. There was formerly a lake of considerable size in the southern part of section 4 which has practically disappeared in the last thirty years. The Northern Pacific and Minneapolis, St. Paul & Sault Ste. Marie railroads pass through this township. The former enters the township in the northeastern part of section 12 and runs in a south-westerly course, leaving the same in the southeastern corner of section 32. This road was completed in 1882 and intersects the Soo line at the village of Henning. The latter road was not completed until 1902. There is only one town in this township which has ever been platted. The present township officers are as follow: Supervisors, Oliver Fossee, S. T. Nyhus and Charles Peppling. clerk, Elof Mollerstrom; treasurer, E. Klimp; assessor, Lars Olson; justice, H. H. Wheeler. The village of Henning is located in the township of the same name at the junction of the Soo and Northern Pacific railroads. It was platted by Charles J. Wright for Hiram L. and Sarah E. Holden, Jacob and Nancy Sallade and George W. Lentz. The question of incorporating the village was broached in the spring of 1887, and within a short time a petition was prepared and signed by a sufficient number of the legal voters residing within the proposed incorporation asking the district court for the privilege of voting on the question. The petition stated that the proposed incorporation included twenty-five hundred and sixty acres and contained a total population of two hundred and fourteen. It is interesting to note that the petitioners submitted to the judge a complete list of the one hundred and ninety-nine persons whose names appear on the state's census of the village taken June 15, 1885. It is not evident why this was necessary and especially in view of the fact that the petition submitted two years after this census showed a population of two hundred and fourteen. The petition was signed by P. H. O'Hara, H. B. Barney, A. Wiley, W. S. Reynolds, Carl C. Langballe, A. S. Paulsen, A. M. Bader, A. Weaver, G. A. Saetre, George A. Paulson, Hans M. Markuson, Hans C. Pedersen, Henry Johnson, George W.	Dixson, B. L. Reis, H. H. Aurberg, Christian Christensen, J. J. Hille, August Parduhu, Jacob Nelson, O. T. Westerberg, B. Andrianne, M. E. Hall, J. Poulson, C. M. Nelson, Olaf P. Peterson, John Anderson, C. Peterson, R. R. Tichenor, J. W. Whitaker, E. E. Saetre, James Leonard, Martin Erikson, J. Gronbeck, D. McMillan, T. Walker and Christian Sorenson. This petition was completed and later granted on August 8, 1887. The first election for village officials was held on September 17, 1887, at the store of J. Gronbeck and thirty-eight votes were cast, twenty-six for and twelve against incorporation. Henning lies at the intersection of the Soo railroad and the Fergus Falls branch of the Northern Pacific. It is a village of approximately six hundred and twenty-five persons. It is thirty-one miles east of Fergus Falls. The churches of this village consist of a Baptist, Swedish and Norwegian Lutheran church, also a Methodist Episcopal. There are two banks, two hotels, two grain elevators, a flour-mill, a creamery and a weekly newspaper, The Advocate. All of the different public and private enterprises are boosters for the town and its growth has been steady and it is a safe prediction that it will continue. Fred Von Ohlen is the present postmaster. The present village. officers are as follow:	President, H. J. Cordes ; trustees, C. M. Anderson, C. G. Hipple and C. G. Hanson; clerk, L. A. Johnson; treasurer, A. O. Saetre; assessor, C Christenson; justices, Iver Bondy and C. W. Barker; constables, H. S. Berg and J. C. Halvorson. Places of birth for Henning Township in the 1905 state census.